IBEC actively works with industry under many different contract agreements, depending on the needs of the company. We establish contract research, assessment, service fees and license agreements, fully tailored to the nature of the project and the interests of the industrial partner. Our decision-making processes are rapid, there’s no red tape, and we’re extremely flexible thanks to our small size and straightforward management structure, which means that we can evolve with projects and adapt to our collaborators’ needs with no need for endless approvals from different stakeholders or decision-makers. These partnerships take full advantage of the IBEC groups’ interdisciplinary expertise in various fields, as well as our state-of-the-art equipment and core facilities. A new video explains the collaboration between IBEC/ISGlobal’s joint unit, Nanomalaria, and the biotech firm Bioiberica to study the development of new compounds derived from heparin to combat malaria. The partnership, which was announced in September 2016, is based on the research carried out by the Nanomalaria group to develop antimalaria therapies. The group has demonstrated that heparin may block the entry of merozoites – a stage in the life cycle of the parasite – into red blood cells, but the problem with heparin is that it has high anticoagulant activity; in other words, the quantities needed for malaria treatment would result in too much blood-thinning and bleeding. Bioiberica, a world-leader in the R&D, production and sale of biomolecules such as heparin, have so far supplied the group – led by Xavier Fernández-Busquets – with 19 compounds of heparin derivatives that have been chemically modified to have low anticoagulant activity, but that retain their antimalarial properties. The Nanomalaria group is currently testing these heparin derivatives in vitro, and when they find a good candidate among the many compounds they’ll test, they’ll move on to in vivo tests with the ultimate goal of finding a product that can, in a relatively short time, be used in malaria-endemic areas. IBEC has signed a collaboration agreement with Avinent Implant System S.L., a Barcelona-based company that is an internationally recognized reference in dental implantology and medical devices for fixing or replacing bone. The strategic alliance refers specifically to a project plan that will be developed with IBEC’s Biomaterials for Regenerative Therapies group, led by Dr. Elisabeth Engel, which will harness the possibilities offered by IBEC’s 3D bioprinter as applied to regenerative medicine. The two sides aim to combine their know-how to produce 3D-printed bone that can be used for various therapeutic strategies for injury or disease, with the ultimate goal of developing a new model for 3D printing applications for bones in the maxillofacial region. With IBEC’s 3D bioprinter one of the very few offering the level of precision and characteristics required for regenerative medicine purposes in southern Europe, the new possibilities in regenerative medicine offered by 3D bioprinting as an emerging technology will put IBEC and AVINENT at the forefront of a new revolution. With its acquisition of the equipment, IBEC pledged to offer 3D bioprinting capabilities to researchers and companies Europe-wide, enabling them to add biological properties to implanted tissues and eventually to manufacture entire organs for transplantation. The pharmaceutical company Ferrer has created a consortium with the Institute for Bioengineering of Catalonia (IBEC) and the bioinformatics company Mind the Byte, located at the Barcelona Science Park (PCB), to study the development of new therapeutic molecules against cancer metastasis. 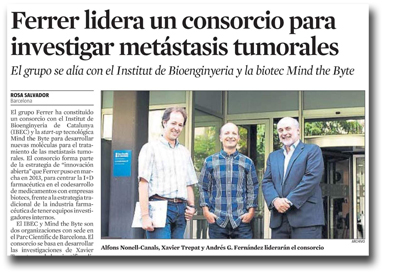 The work will follow the research on cadherin interaction and its role in cells that cause metastasis conducted by Dr. Xavier Trepat, ICREA professor at IBEC and one of the few scientists to have won three grants from the European Research Council (ERC). Right: Alfons Nonell-Canals, Xavier Trepat and Andrés G. Fernández lead the consortium on behalf of Mind the Byte, IBEC and Ferrer. In the first phase of the project, to be started this September, Mind the Byte will computationally model the interactions of cadherin molecules and will design molecules to act as potential blockers. The decision to incorporate the computational design at this early stage “is to reduce costs and time,” says Nonell-Canals. Later in the project, Dr. Trepat’s team will be responsible for testing these molecules. For its part, Ferrer will contribute their know-how on chemistry and pharmacology and their expertise in drug development, and will take on a key role as an industrial partner at a later stage if the expected results are achieved. Ferrer’s current pipeline includes over a dozen external projects through a strategy of innovation based on collaborations and partnerships with public research groups and biotechnology companies with the aim of tackling unmet clinical needs. IBEC, a multidisciplinary center focusing on bioengineering and nanotechnology, has renewed its push for technology transfer by implementing fast and red-tape free decision processes. As emphasized by Dr. Xavier Rúbies, head of the technology transfer unit at IBEC, knowledge of the market and its determinants is essential to ensure a real transfer. The Institute for Bioengineering for Catalonia (IBEC) and Genomica S.A.U. (Grupo Zeltia), the leading Spanish company in molecular diagnostics, announce the creation of a Joint Research Unit that will provide an operational framework for close interaction on various R&D activities related to healthcare. The unit, which will be located at IBEC’s headquarters in Barcelona, will see researchers and industry technicians sharing a host of know-how and in-house capabilities to develop and bring to market point-of-care diagnostic products and other medical devices and technologies. IBEC’s researchers in the unit will supply the scientific knowledge with their expertise in biosensors, micro- and nanofabrication, signal processing and bioengineering, while the members from Genomica’s side will offer market intelligence, clinical evaluation and regulations, and diagnostics know-how. It’s the first time that IBEC’s researchers will physically work together alongside industry personnel, though the institute already has several existing collaborations and research agreements – with companies such as Ferrer International, Ficosa and Grifols, as well as Genomica itself – related to the development of specific projects and the transfer of technologies. “The establishment of our joint unit bridges the often wide gap between research and industry, and will enable many of our health-based research areas that we have at IBEC to reach the market and the patient sooner,” said Dr. Josep Samitier, Director of IBEC. “This long-term collaboration with Genomica demonstrates the confidence that this major company – currently the leader in forensic identification in Spain and an international benchmark – has in IBEC as the right partner to offer the deep scientific knowledge and state-of-the-art scientific instrumentation to respond to specific industrial needs in the area of healthcare technology. IBEC’s Joint Research Units with industry provide an operational framework for close interaction on various R&D activities related to healthcare. Researchers and industry technicians share a host of know-how and in-house capabilities to develop and bring to market point-of-care diagnostic products and other medical devices and technologies.